For the serious gamer, these ergonomic and moderately priced gaming chairs double up as a racing themed cockpit style gaming chair that people seem to love. We were lucky to find this GT Omega Racing Chair in-stock and it’s hard to find them being shipped from the U.S., so we had to see what all the fuss was about. GT Omega racing chairs have been kicking up trails for a while now, and we’d known that sooner or later, we were going to run into this behemoth of a racing office chair. 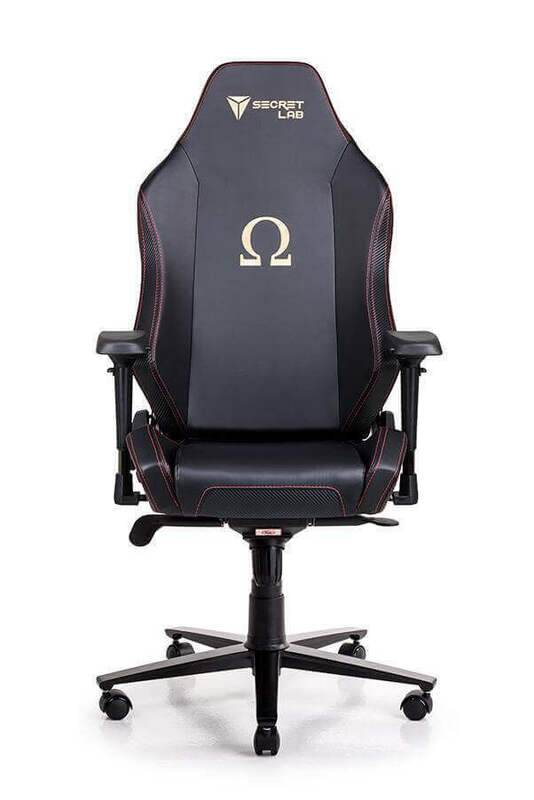 I’ll admit that curiosity usually gets the better of me and I end up trying out every gaming chair I come across, but for some reason, GT Omega racing chairs have always seemed to elude me. Truth be told, we were pretty fortunate to end up getting our hands on this one as retailers are frequently short on stock. With a freshly assembled chair and a neat pile of packaging in the corner, I threw myself into this racing office chair, not knowing what to expect. The design is simple but smooth with an all sleek black overlay on the embroidery but featured some unique marking and comes with their own lumbar and neck pillow, so that’s a big bonus. The armrests are pretty wide and overall the chair looks really comfortable, so we were excited to give this one a shot. Even after spending a couple of hours in this chair, it surprisingly manages to retain that “roomy” feeling that you get the moment you plop yourself down into it. At first glance, it’s pretty obvious that this chair is designed to cater to large people and is built to withstand quite a lot of weight. But, what really impressed me was how well it catered to an average sized person like me as well. The seat never does feel like it isn’t ergonomic enough and after a couple of minutes, you feel like you fit right in. I personally think that this is one of those chairs that actually feel better without the lumbar cushion in place. While this is entirely subjective, I can imagine that someone larger or with different preferences might prefer using it. I can’t tell what’s on the armrests from the picture. Are they soft or hard? I’m 6’ tall, will I be able to comfortably enjoy this chair? How deep is the seating? When it comes to the design of this Omega chair, it’s hard to classify because all Omega chairs usually come with a great design. The design of this GT Omega Racing Chair was obviously made in mind with racecar drivers and enthusiasts who want to feel like they’re in the front seat of a racecar. The straps that hang down from the neck support to the lumbar support, the racing inspired logos and the armrest width gives you that true racing feeling, whether you’re just relaxing or playing your favorite racing game. The overall base is quite lengthy as well so you can adjust yourself accordingly. The accents on this chair run all the way around the body and up the length of the backrest. We think that there’s definitely quite a lot of potential in dual tone upholstery color schemes, but this time, it just isn’t anything quite new and isn’t really enough to set this chair apart from the many similar gaming chairs out there. If there’s one thing you don’t have to worry about, it’s the durability of an Omega racing chair. These chairs are super strong and made with incredibly high-quality material, even if they don’t charge top dollar for their chairs (and they usually don’t). Any chair that allows people to lean back and lock in place needs to be built with precision and longevity in mind because that puts a lot of strain on the base of the chair. The leather material is tough, the spring is gas powered and the base is made with heavy duty materials. The gas piston on this chair is pretty impressive and sets it apart from most of its competition. It’s a hydraulic piston that is rated to withstand an insane 400lbs of weight. The manufacturer also assures us that the rest of the frame is designed to withstand similar levels of stress, though we wouldn’t really be brave enough to put that to the test. We’ve also noticed that the satin-like finish on the metal parts of the base is actually scratch resistant, to a certain degree. We wouldn’t take a key to it, but it certainly is a nice extra touch. Another thing you generally never have to worry about when you purchase an Omega gaming chair is the overall comfort quality you’ll receive when you sit down. This racing office chair can adjust back to 160 degrees for people who want to lean back and relax while they listen to music or take a quick nap before a meeting. The base cushion is squishy and soft, so it’s fun and feels great to sit on the base cushion. Then there’s the addition of a lumbar and neck cushion pillow which is always a huge plus and they’re soft to squeeze as well. All around, you’ll be surrounded by a lot of high-quality foam material from the base all the way up to the head pillow. Angle Adjuster – For some people, they don’t like sitting straight up when they game and I’m one of those people. I like to be tilted back a little bit and with this chair, you can tilt anywhere from 85 degrees back to 160 degrees, which is nearly flat on your back. That’s probably not the most advised option for gaming but it’s still an option for those who enjoy that. Added Comfort – The addition of the headrest pillow and the lumbar support pillow are a great addition to any racing office chair because gamers are usually seated stationary for long periods of time. This does a number to your neck, your back and your lower region as well. It’s great to have extra pillows that helps promote positive posture, doesn’t put a strain on certain areas and helps the blood flow overall to your body. Leather – The leather material used in this chair is completely synthetic and looks like a sleek midnight style of black. It’s a great look, it feels good to the touch and it’s very durable. The material is high quality and is easily one of the best leather surfaces we’ve seen for some time. Height Adjustable – We love being able to adjust the height because some people’s desks sit higher than others and some people like to sit lower than optimal seating position for the desk and the chair. Everyone likes to work at different heights, so this chair makes that easy with a smooth and gas-powered cylinder which gently raises up or down depending on which direction makes you more comfortable. Unique Design – The design of this Omega Racing Office Chair is superb in every way and makes you really feel like you’re right there in the seat of a race car. Everything from the straps, the logos, the armrests and the cushioning can fully immerse you right into the game. The armrests are very soft and they’re padded as well for ultimate comfort and your leisure. When you rest on the pads, it’s made to protect your joints and not to add extra strain to your hands or arms in general. Yes, you will. This chair was made with a relatively lengthy backrest height and most racing themed gaming chairs generally are made extra tall for that reason. If you’re over 6’5, your head might start going off of the back of the headrest but that’s an uncommon height for the majority of people. The seating is pretty deep but it’s also very breathable or otherwise known as bounce-back. 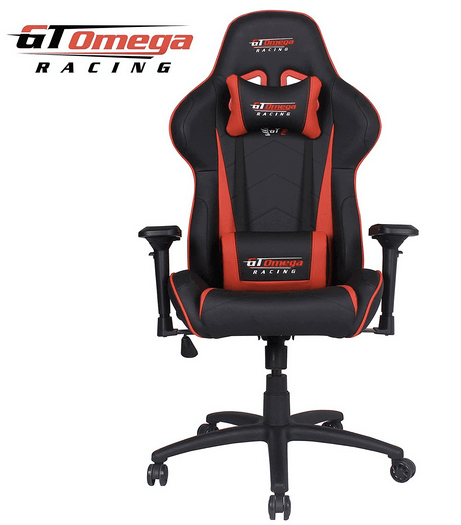 When you sit in the GT Omega racing office chair for a long period of time and stand up, it will go back to its original form without losing any cushion or taking damage over time. The GT Omega Racing Chair is relatively difficult to get a hold of in the U.S. so when it’s available, you better snag it up ASAP. However, there are some outside sellers that will ship to U.S., you’ll just have to pay a little extra. It’s a great chair, it has really good durability and it will last for a long period of time. It's a great company and they’re great with support, which is why we back the GT Omega Racing Chair 100%. for more on PC gaming Chairs you can check this article.